Did you know that there are some types of teaching jobs available with an associate’s degree only? Associate’s degrees in education require two to three years of full-time studies to introduce aspiring teachers to fundamental instruction skills. Most will include a practicum to provide real-world teaching experience and an insider’s glimpse into the classroom. Attending a community college or vocational school to earn an associate’s degree is a popular and affordable route for building basic educational knowledge before transferring to a bachelor’s program, according to US News and World Report. 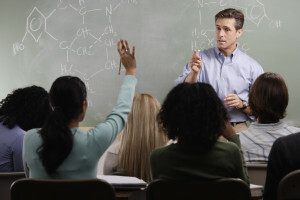 However, it’s possible to immediately enter the workforce after graduation and start pursuing your passion for teaching. Below we’ve highlighted some rewarding teaching jobs that usually only require an associate’s degree or diploma. Preschool teachers lead Pre-K programs for young children between the ages of three and five years old who haven’t yet entered kindergarten. Preschool teachers are given the task of teaching reading, writing, basic math, science, and other subjects in a simple way that sparks a love of learning in young minds. By creating a playful curriculum that targets key area of child development, preschool teachers play a prominent role in setting children up for lifelong academic success. Having an associate’s degree in early childhood education is the best preparation. Many states require preschool teachers to have Child Development Associate (CDA) certification too. Preschool teachers bring home an average annual salary of $32,040, according to the Bureau of Labor Statistics. Teacher assistants, also referred to as aides, work under a certified teacher’s supervision to provide extra one-on-one attention to students struggling to learn key concepts. After teachers introduce new material, teacher assistants will reinforce the lesson by developing activities suited to each student’s unique learning needs. Other typical duties include tracking attendance, helping teachers prepare lessons, setting up educational equipment, supervising students, and enforcing class rules. Elementary, middle, and high schools hire teacher assistants usually with at least two years of post-secondary education. Teacher aides looking to work with students with disabilities should have an associate’s in special education. Teacher assistants earn a mean yearly wage of $26,000, according to the Bureau of Labor Statistics. Childcare workers are given the responsibility of caring for children’s needs when their parents or guardians are unavailable. Childcare workers often work with infants, toddlers, and preschool children, but some will watch school-aged children after school. Childcare workers use their teaching expertise to introduce young children to basic life concepts and social skills. Through play, childcare workers are able to teach children manners, problem-solving, vocabulary, and more for optimal child development. Childcare workers also lookout for signs of developmental delays to seek early intervention. With an associate’s degree or high school diploma, childcare workers can find jobs in daycares, schools, religious organizations, Head Start programs, and preschools. Childcare workers make an average yearly income of $21,710. Earning an associate’s degree in education could also set you up for an administrative career as a childcare center director overseeing the daily caregiving activities. Although this isn’t exactly a teaching job, it’s the highest paid education position offered to associate’s degree holders with certification. Advancing into more lucrative teaching jobs will likely require investing in a four-year bachelor’s degree in your chosen education specialty. While there are several types of teaching jobs available with an associate’s degree, most states will mandate having a baccalaureate education to become a licensed classroom teacher.